(DISCLAIMER – The advice given here should not replace the instructions given by any professional health care provider. In our office, we’re all about empowering parents. Even before conception, we use chiropractic care to help set the tone for a healthy body to best support procreation and throughout pregnancy. We put a lot of emphasis on helping moms feel comfortable and resilient throughout the increased demands during pregnancy, childbirth and post-partum. We are parents, too, and we know we can do things to help our kids to prevent little issues from being big ones, and to help our kids recover from bigger issues over and above any interventions prescribed by health professionals. This article will cover how to help relieve congestion in kids and adults using massage. There are 3 types of congestion most common in families. The first has to do with the digestive tract, the second with the immune system (ears, nose, throat & chest) and the third concerns circulation to the arms and legs. What is congestion in the digestive system? This is a sluggishness in the intestines (bowels) that can happen for a variety of reasons. Perhaps your diet is lacking in fibre or water. You may be too stressed to relax and allow normal bowel function to occur. You may not feel stressed, but the nerves controlling bowel function may be mis-firing because they are under stress. You could be having a side effect from medication or food poisoning. There could be a physical blockage from a tumor or scar tissue or congenital deformity. What does this congestion look like symptomatically? It can be sluggish or delayed bowel movements. You may also have “regular” bowel movements, but they’re not complete, and residue is building up. You might notice bloating. When the food residue is in you too long, it can ferment and create that excess gas, which can also appear as excess flatulence in babies. You might notice reflux or excessive spitting up. There could be a hardness in the belly, crying at tummy time, or excessive crying in general. In children (or adults), you might notice trouble holding in bowel movements or urine before getting to the washroom, bed wetting, tummy aches, or abdominal distention. It will take a visit to a health care professional to diagnose the problem, and to determine if it’s something serious. 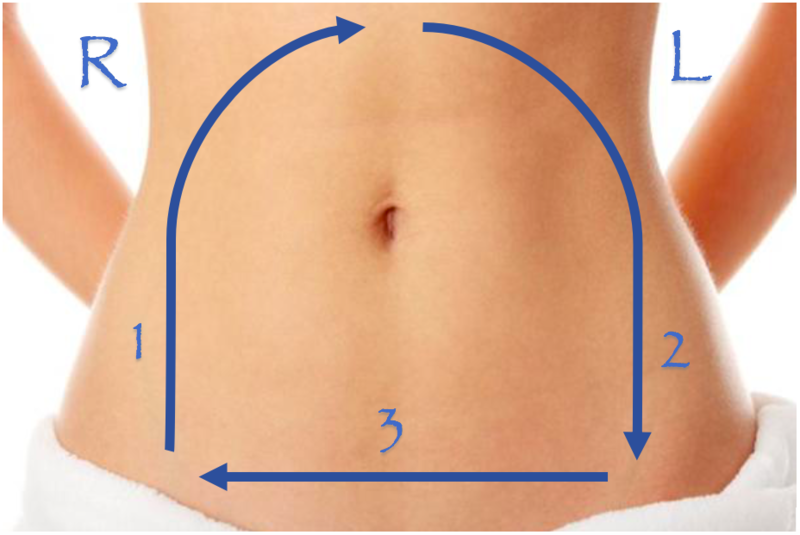 An abdominal massage can help a food bolus in the intestines move along, to speed up sluggish bowel movements. Done gently, it can also help calm down intestines that aren’t moving food in a concerted manner. This same massage helps when the colon is irritated for whatever reason, including if you’ve had food poisoning, or as a reaction to junk foods, or food your bowels don’t tolerate well. The abdominal massage is done with the “patient” lying on their back with comfortable clothes on (like pyjamas, leggings, exercise clothes, etc.). Using the flat pads of your fingers, do gentle circular massages from the bottom right corner of the abdomen up to the ribs, across to the left side and back down. This is basically going clockwise, starting on the bottom right. Massage therapists sometimes call this the “I love you” massage as the direction makes an upside-down I, L, and U shapes. The direction is essential. The bottom right corner is where your appendix is located. This is where the small intestine connects to the large intestines and where the food bolus is most likely backed up, as it needs to go up against gravity. If you feel any hardness along the way, massage a little longer in that area. Continue for one to two minutes. This massage should not be painful. If it is, then lighten up. If it’s still painful, even to light pressure, seek the help of a heath professional. After the massage, you can put a hot water bottle to the “patient’s” abdomen for up to 20 minutes. You’ll want to center it on the abdomen, covering the navel and at least 2 inches above and below it. This will stimulate powerful acupuncture points for digestion (2” above the navel) and elimination (2” below the navel). It should feel good. If you feel your intestines gurgling, this is a good sign. If you find yourself going more frequently to the washroom, this is also a good sign. It shouldn’t take long (few days to a couple weeks) for your bowel movements to become regular. Keep up the massage and hot water bottle once daily until your abdomen feels good and bower movements are normal and regular (Individual cases may need a modified schedule). If you are weaning off laxatives, do it gradually and be prepared there can be a withdrawal rebound effect. For maintenance, 12-20 seconds of massage may be enough. This massage is exceedingly valuable in the colder months of the year when we’re more prone to sniffles, coughs and colds. The cervical lymphatics are the drainage system for all mucous & congestion in the head and neck area. We produce mucous every day, all the time, to keep our eyes wet, nasal passages and mouth and throat moist. We produce extra mucous when the air is dry or windy, when we eat, when we cry, when dirt gets into our eyes, when we’re injured, when we have extra germs to fight, when we’re thirsty or when our mucous membranes are irritated. This mucous is a necessary component of the immune system, especially as it relates to the respiratory and digestive systems. When congestion builds up in the cervical (neck) lymph nodes, the mucous can back up into areas of the head and neck. You might feel the congestion in your sinuses in the forehead, around the nose, or under the eyes. It can clog up your inner or middle ear and affect your hearing or balance. You might have a runny nose or plugged up nose, depending on how thick the mucous may be. Congestion into your throat can give you a sore throat or make you cough. If you can’t cough up the excess mucous (or if you take cough suppressants) the mucous can flow instead, into your chest and lungs. Itchy, watery eyes are a sign of congestion backing up into your tear ducts. 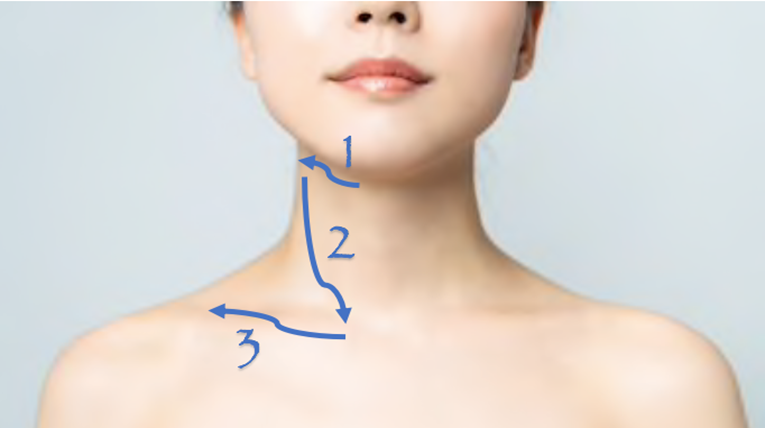 Swollen lymph nodes can be felt from the outside just under the chin, behind the ear and down the side of your neck, either just in front of, or behind the sternocleidomastoid muscle of the neck. To massage the cervical chain of lymph nodes, it is best if the patient is lying on his or her back, with the head comfortably on a pillow. Using the flat pads of your finger, do gentle circular massages, starting just under the centre of the chin, and follow the line of the jaw up to where the jaw meets the ear. From here, massage in circles down the side of the neck, lingering over the swollen areas. Finish off the massage by sweeping above and below the collar bone from the sternum out to the shoulder. This should take up to 1 minute and should not be too painful if you do it lightly enough. The direction (“Z” pattern) as opposed to backing it up further. Recently swollen nodules are soft and very tender. Older nodules are harder and more well-defined, but still tender. Hard nodules that are not tender at all are not normal. Tell your health care provider and get a professional assessment. Ideally, you would have seen your health professional first to identify whether the swelling you feel is indeed the cervical lymph nodes and if you should be massaging them in the first place. To speed up the drainage process, you can use regular strength white Tiger Balm. (Do not use on children under the age of 6). Using a tiny smear of Tiger Balm on your fingertip, massage the cervical lymphatics in the manner outlined above. The heat produced by the active ingredients of camphor and menthol will help liquefy the mucous, so it drains more easily. You can also put some (very little) on congested sinuses, the throat, and the chest. Be careful to avoid around the eyes as the fumes from the Tiger Balm can sting and cause swelling of the eyelids. Do not use if you have very sensitive skin, if you’re allergic to it, or if the patient can’t understand about not smearing it onto the eye area or eating it. Do not use stronger versions (extra-strength, ultra-, super-, etc.) for this purpose. The third massage we’ll cover is for improving circulation to the extremities (arms, legs, hands & feet). This massage is valuable for those with cold hands and feet, numbness and tingling related to circulation, and swelling in those areas. It is imperative to visit a health professional first to determine if these symptoms are part of a bigger problem that needs immediate or intense attention. Even before massaging, you can increase circulation to your extremities through movement. Activating muscles and moving joints in your arms, legs, hands and feel will automatically increase circulation to these areas. Exercise is excellent to increase overall circulation in the body. If you’re short on time or physical ability to exercise, you can still keep the circulation going with gentle movements; like swinging your legs or playing a musical instrument. If you’re really good at meditating, you may be able to use your mind to bring more circulation to your hands or feet, as in the ancient Chinese practice of Qi Gong. Now for the actual massage. Always with massage, you’ll want to use the flat part of your fingers and hands. We never want to bruise our “patient” and the muscles on the arms and legs are more prone to bruising than the muscles on the back. Starting with the hands, use your finger pads to press into both the front and back of the patient’s hand, from the wrist to the palm, and then each finger independently. If you use both your hands, you can work on more parts of your patient’s hand at the same time. When finished with one hand, massage the other. For the arm, you’ll want to use your flat palms to do the massage, and your other hand to stabilize the patient’s arm. This way, the patient doesn’t need to use any strength to hold up their own arm. Always massage from the wrist to elbow, and elbow to shoulder. This brings the circulation back up to the heart. Going in the opposite direction will cause swelling in the parts further from the midline. For the feet and legs, it’s easiest if your patient is lying down, shoes off. Massage the feet as you did the hands, one by one. For the legs, you’ll want to use flat palms to prevent bruising the skin. Since the leg is resting on the bed or floor, both hands are free to do the massage at the same time. As before, go in the direction back to the heart, from ankle to knee, and knee to hip. Clothed or unclothed? I prefer when the patient is clothed in long sleeves and long pants so your massaging hands can slide up the material. If not covered, then a massage oil helps your hands slide and not create friction. Unclothed, you may be able to see bulges under the skin or moles or markings that may need attention from a health professional. Please note that these massages should never replace seeking help from a proper health professional. Holistic chiropractors work at the nerve level to help the body get back on track, especially when the issues are in the very early stages or not yet serious. These massages and chiropractic can also be used preventatively, especially if there is a personal or family history of such issues. To get a holistic look at your child’s (or your own) health, please visit fill out our Baseline Health Questionnaire and phone our office (604 566 9088) to book a consultation with Dr. Sabrina Chen-See.